BUBBUN is a charming little browser based puzzle platformer where you control a little bunny that can shoot out bubbles and use them as platforms. To make your way through each level of BUBBUN you must use your bubble gun to help you overcome obstacles, avoid deadly hazards and collect all the carrots before making your way to the exit. The bubble blowing mechanics are similar to those seen in the arcade classic Bubble Bobble, but in BUBBUN they’re more stable so you can stand on them for a few seconds before they disappear. 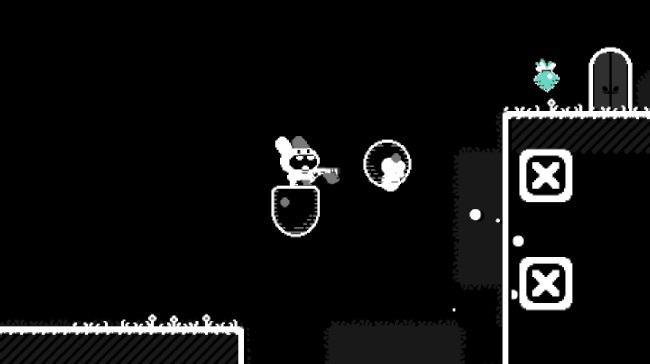 It takes around 10 minutes to play through BUBBUN and it’s not the most challenging platformer in the world, but the pixel art animation is great, the character is responsive and the bubbles are fun to use. A quirky little buble bouncing puzzle platformer well worth jumping on.